* For buyers outside of the U.S., contact us directly for shipping costs. We will mail your DVDs upon receipt of payment or purchase order. Click the image to the right for the PDF article of The Berkeley Civic Courage and Heroism Experiment: The Group Dynamics of Individuals Acting in Concert to Advance Ethical Goals in the Public Interest. Written by Bill Roller and Philip Zimbardo, reprinted from the International Journal of Group Psychotherapy, Volume 67, Number 3, July 2017. The Berkeley Civic Courage and Heroism Experiment is a pioneering study that begins with a different premise than the Stanford Prison Experiment: What group dynamics bring out the best in human beings and allow them to act together in alignment with their moral beliefs—even at possible risk to themselves? We began our experiment with the belief that many people of all ages want to take courageous nonviolent action in support of their ethical convictions –but don’t know how to do it. But people who want to act with civic courage must first learn how to seek out other like minded individuals to join them in pursuing a common goal. 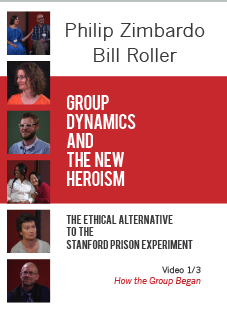 GROUP DYNAMICS AND THE NEW HEROISM is a six hour video series which captures the unscripted, spontaneous group process of eight individuals as they learn how to work together and form groups that will help motivate and sustain the courageous actions they wish to pursue. Our film tracks them as they obey their conscience and act in concert with each other. The viewer can follow the steps of the group as they organize themselves to act courageously and nonviolently for an ethical cause—then see them carry their project to fulfillment. We supply commentaries to help viewers follow the progress of the group. Scapegoating was the primary dynamic in the Stanford Prison Experiment. But scapegoating is not the only way to create drama in a narrative. We present a dramatic story that is fresh and new—of people who resist scapegoating in all its guises, challenge unjust authority, and act in the public interest. Our film series will help people practice civil obedience to universal values enshrined in the Universal Declaration of Human Rights and the laws of the United States. It will guide viewers to act with respect for humanity, resist scapegoating of those who appear different, and activate the creative energy of nonconformity. This film series is essential viewing for organizations dedicated to peace and justice who want to put their political and social thought to work in real life situations. College and university departments of social psychology, sociology, psychology, political science, anthropology, and other human sciences will find the format useful in creating classes that challenge and inspire students. 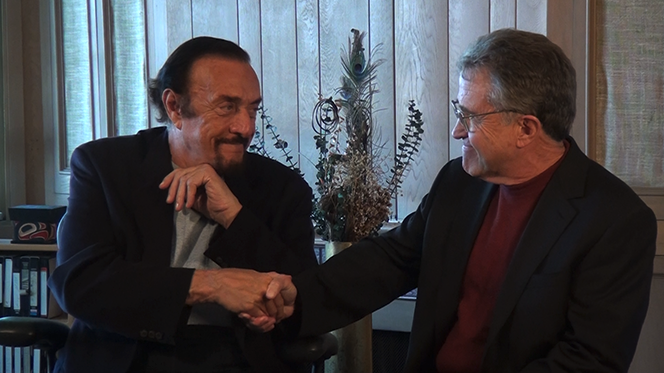 Philip Zimbardo & Bill Roller.